I love, love, love mint. That’s one of the best things about growing herbs is having mint in my tea every day. I dry it to use over the winter, but it’s not as good as fresh from the planter right before making my tea. I even have two types of mint – spearmint and a chocolate peppermint. The chocolate peppermint has chocolate overtones to it. My husband offered to put in another garden bed to grow nothing but mint. The problem? Because mint grows so prolifically, you cannot let it loose in a garden or lawn. It will take over everything. Similar to the trumpet vine, it puts out a long tap root from which everything sprouts. Severing the tap root doesn’t matter – once the sprouts come up, they don’t need the tap root anymore. To grow mint and not be eradicating it for the rest of your life, it is necessary to partition from everything else. A simple raised bed garden won’t do, nor will a garden border. It needs hard sides and a hard bottom, like a plastic container and it has to be kept away from the ground. Seriously, it will escape and you will be sorry. 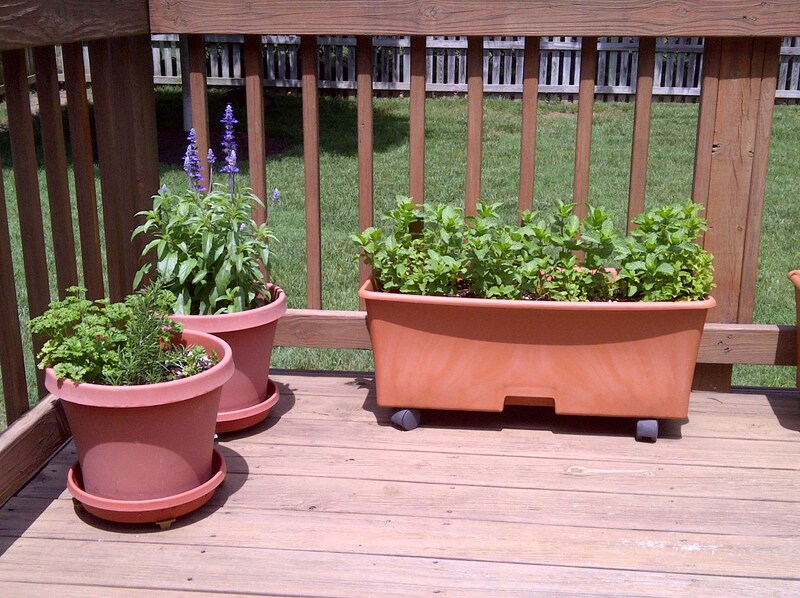 I grow it on the deck – it’s in the rectangular container on the right. Mint likes water, so it’s in a container that has a water reservoir in the bottom. The deck can get really hot – last weekend was 135 degrees – and it doesn’t mind that either. Tomorrow I’ll share hints on using mint and taking care of it. Word for tomorrow – SHAKEN. If you prefer to work ahead, see the list for the week under “A Word A Day”. Good idea for growing the mint. Maybe I’ll try it. You’re welcome. Mint is really easy to grow – if you accidentally kill it, just try again. It really is a noxious weed. I’m dreaming of that chocolate mint. 135F- oh my, I could never survive living where it gets that hot. Glad the mint doesn’t mind it. That chocolate mint is delicious, but the chocolate is more overtones than a strong flavor. It’s not hard reaching 135 degrees when it’s full sun on wood. The ambient temperature wasn’t that high – about 95 degrees.